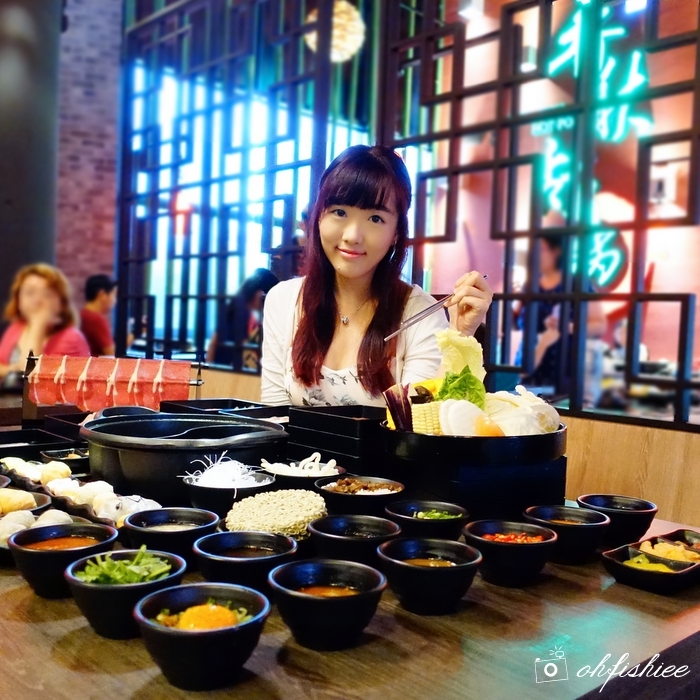 Welcome to the largest premium Taiwanese hot pot restaurant in Malaysia! If you have been to Taiwan, do you remember those popular steamboat shops that you see along almost every street? 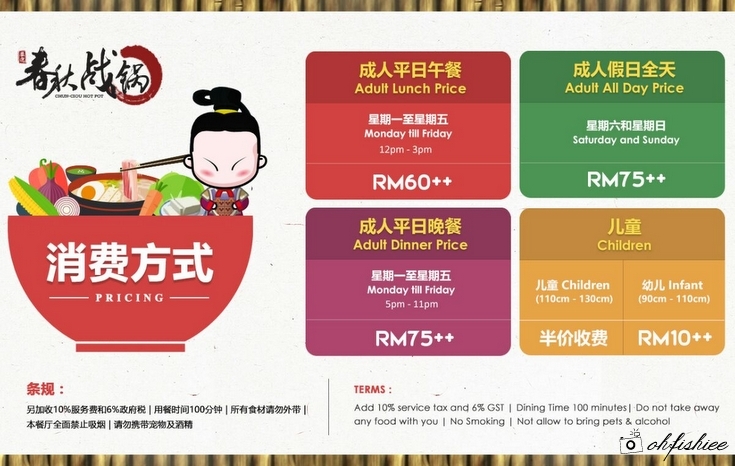 For a taste of Taiwanese steamboat, you don't have to travel all the way there anymore because the first authentic Taiwanese imperial "served-to-table" hotpot buffet is now in KL! Originated from Taiwan, Chun Ciou Hot Pot (春秋战锅) brings us the best ingredients and recipes exactly like those in Taiwan. 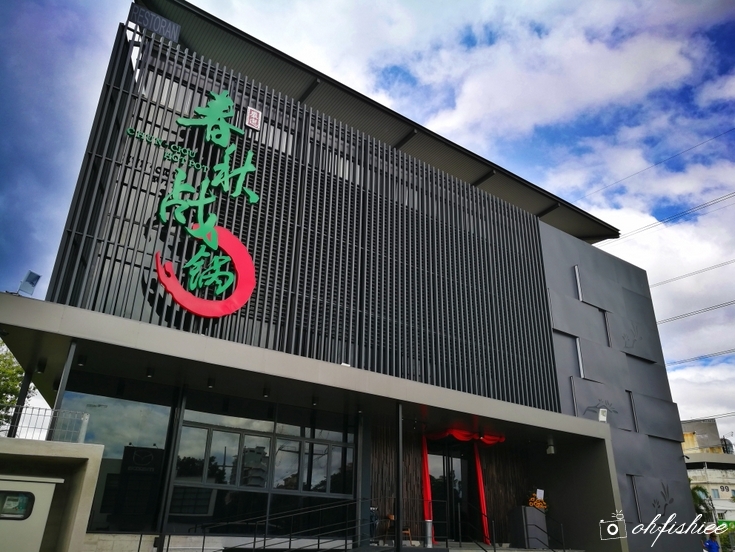 Tucked along the busy street of Old Klang Road (same side as Scott Garden, very near to Mid Valley), Chun Ciou is a stand-alone double-storey outlet in black with a huge signage on top which you can't miss upon passing by. Chun Ciou boasts an elegant and heroic dining atmosphere with abundant Chinese historic elements. 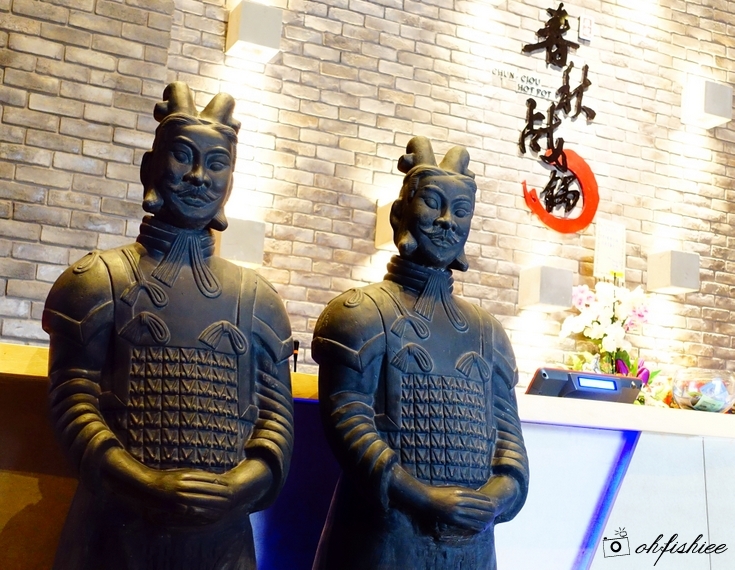 The entrance opens to several dramatic craved Chinese statues standing boldly at the reception counter. Even the waiting area is tastefully adorned with high red chairs that make this space very Instagram-worthy. The vast caverns lead to a brick-walled restaurant with spacious seating on both levels, creating a lively but intimate dining experience. The traditional Chinese lanterns light up the room, around which comfortable spaced tables are adorned with classy tableware. The interior exudes a contemporary feel to match the blend of modernity and classical Taiwanese hot pot food served. Most importantly, it is fully air-conditioned and the space, despite full-house, is not stuffy at all! The ambiance is made so comfortable for both lunch and dinner, especially when it is becoming a trend to have steamboat gatherings during lunch time now. The main highlights of the menu are all printed above. 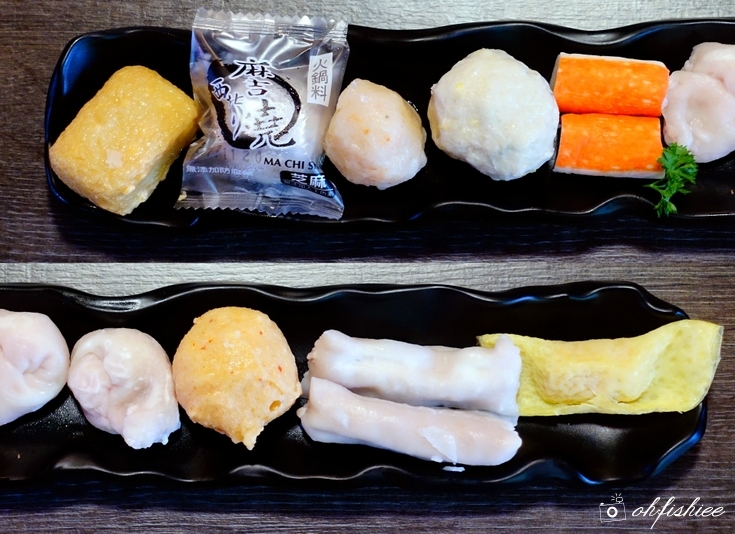 From the soup base and meats to the myriad choices of sides and desserts, they are all the "basics" in this Taiwanese hot pot place. For the first time, I try the Lake Salt Soup Base (湖盐汤底) which is similar to our local Superior Soup (清汤) but slightly more savoury. My next favourite is the Sukiyaki Soup Base (壽喜湯底) which is very strong in flavours, suitable for dipping the meats. 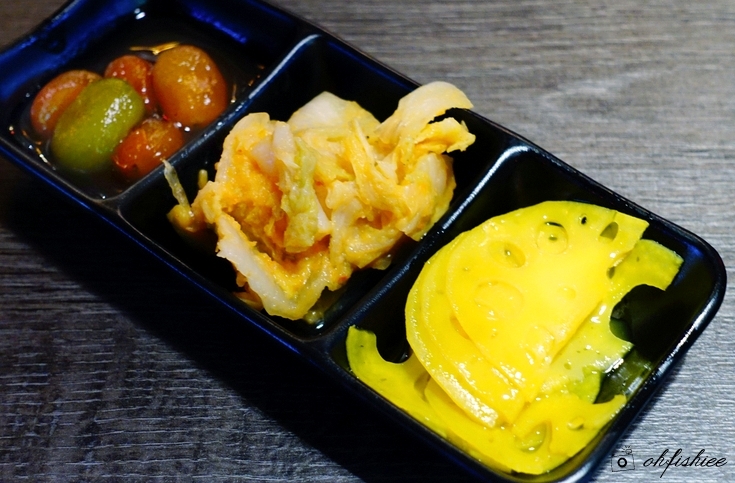 Pickled Cherry Tomatoes (梅漬蕃茄), Golden Kimchi (黄金泡菜) and Pickled Lotus Root (芒香藕片). gorgeous thick sweet and savoury gravy. This comfort food is so addictive that we can't stop eating. Here we are spoilt with myriad choices of premium grade meats. And the best part is, you can order as many as you want, and the food will be delivered to your table by the attentive staff. Soups are constantly refilled and empty plates are never left to linger long on the table. 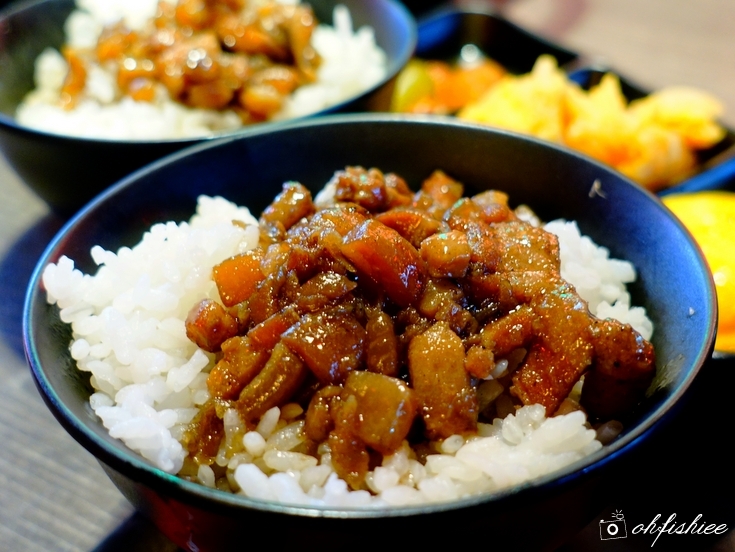 *以上食材无限供应 Unlimited orders are available. The thinly sliced pork comes in a good balance of lean and fatty layers. Yummy! How to best enjoy the beef? Just dip into the Sukiyaki broth for 3-5 seconds and enjoy it according to your preferred level of wellness. To be honest, there are just too many types of meatballs (More than 20 types!!) to be chosen from! 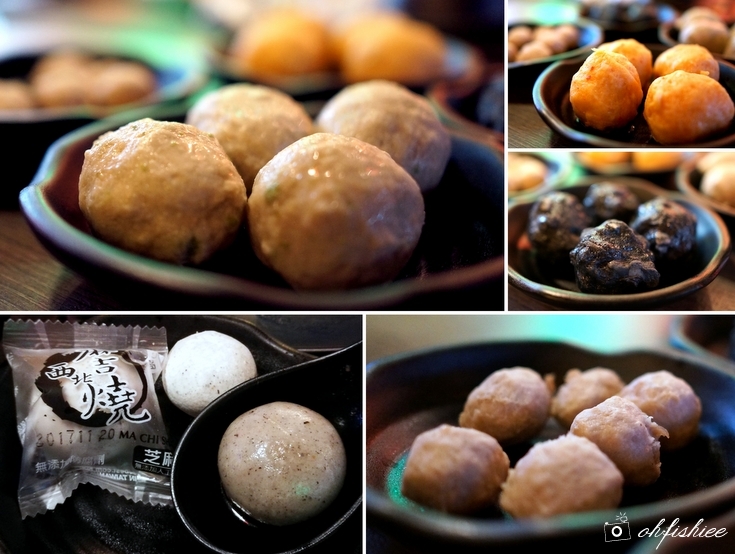 After trying lots of them, I enjoy the Wasabi Ball (芥未丸), Black Sesame Mochi (黑芝麻糯米糍), Pork Tendon Ball (猪筋丸) and Handmade Meat Balls (手打肉丸). Some burst in the mouth with lots of juicy meaty goodness. 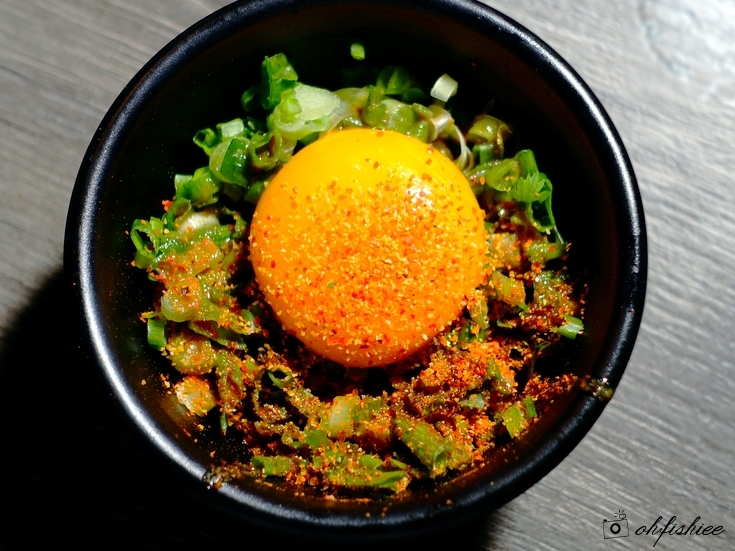 This spicy (麻辣) ball is highly recommended for spicy lovers too!! Be careful, the spicy juice will burst upon biting into the bouncy ball. 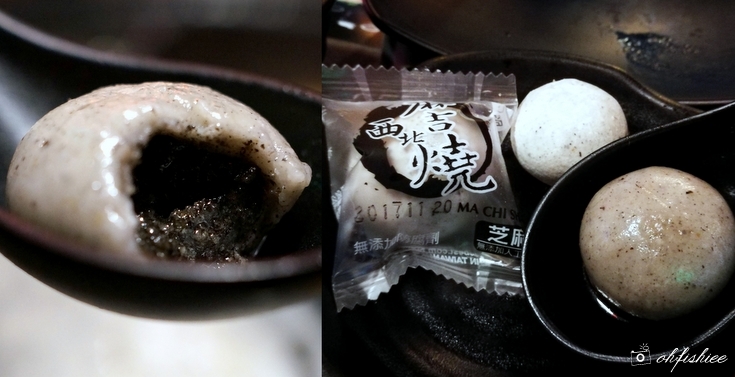 And the Black Sesame Mochi (黑芝麻糯米糍) is great for those who want a sweet finish. To balance the meal, we also add some noodles and vegetables into the broth. The slices of Pumpkin and Cabbage add natural sweetness into the soup. Another unique feature of Taiwanese Chun Ciou Hot Pot is the choice of sauces! Here you can choose among 10 types of sauces and condiments to create your own combination of flavours and pair with the steamboat ingredients. I especially love the chilli sauce for a spicy kick. You must try creating this Chun Ciou Signature Sauce (招牌酱汁) from the raw ingredients! Tadaa! Now we are done with this golden egg yolk sukiyaki sauce which helps enhance the meat texture and juiciness while bringing down the hot pot heat on the meat. ranging from cold drinks to hot Chinese tea. 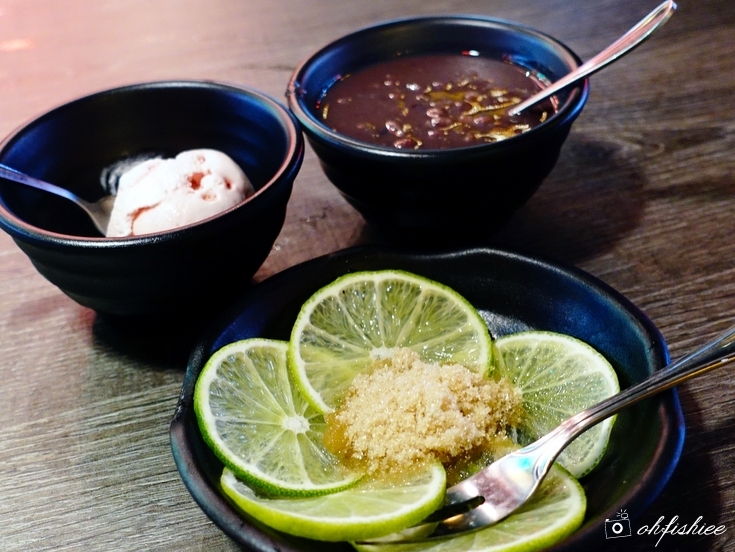 Chun Ciou's desserts are equally great for both adults and children. The red bean soup is very thick and not too sweet for my liking. Here you can taste every bit of the red beans, adding nice texture to the dessert. love tangy sweet flavours. The balance of sourness and sweetness is just perfect here. 1. Everything is so Taiwanese here-- from the top notch quality Taiwanese-style services to premium ingredients and recipes from Taiwan. 2. Comfortable, modern, air-conditional atmosphere-- No sweats, and very cosy feeling when dining here. 3. 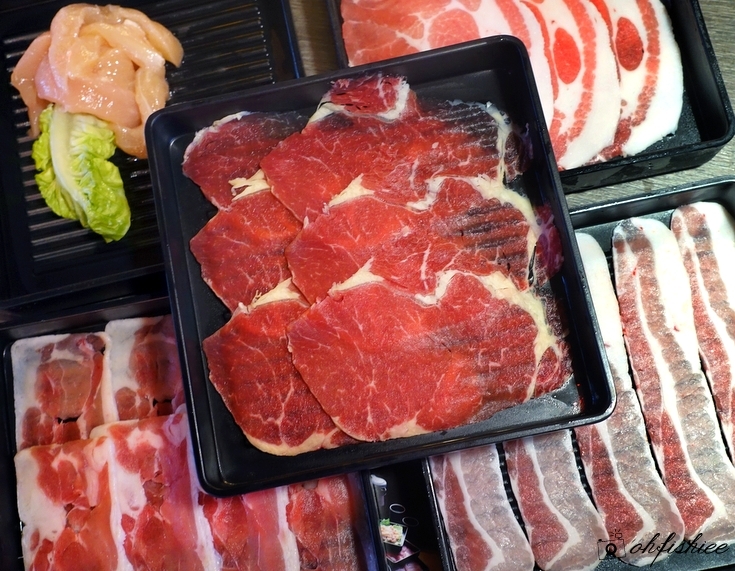 Spoil with various choices-- Premium air-flown ingredients from Taiwan, high quality meats, special broths, unique sauces, and signature desserts. To make a dating site work, the website needs to initially have sensible alternatives. Delete Plenty of fish account The company and also its individuals have actually suffered from misinformation.